Mrs. Sandra Dooley Hughes, age 72, of Toccoa, GA, passed away Friday, March 29, 2019 at Stephens County Hospital. Born May 28, 1946 in Toccoa, she was the daughter of the late Estee Elijah and Sula Powers Dooley. She was a member of Sunnyside Baptist Church and was retired from Purolator. Sandra also worked at Trogdon Furniture, Milliken, and Reliable Electric. Family members include her sons and daughters-in-law, Kevin Smith and Sherri and Mark Smith and Susan all of Toccoa; step-daughter, Julie Henson; several grandchildren; sisters and brothers-in-law, Brenda Martin and Pierce and Betty McCall and Guy; and numerous nieces and nephews. 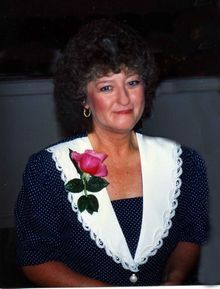 She was preceded in death by her husband, Ronnie Hughes; sisters, Buna Minyard, Jennie Sue Chitwood, and Barbara White; and brothers, Paul Dooley and Harold Dooley. Funeral services will be held at one o'clock Monday, April 1, 2019 from the Chapel of Whitlock Mortuary with Dr. Jesse Colbert officiating. Burial will follow at Roselane Cemetery with the Rev. Paul Jameson officiating at the graveside service. The following gentlemen will serve as pallbearers; Haden Smith, Dillan Smith, Zackary Smith, Steve Cheek, Jake Pruitt, and Steve Pruitt. The family will receive friends at the mortuary from 5pm – 7pm Sunday, March 31, 2019 and from 11 am until the service on Monday, April 1, 2019. Flowers are optional. Those desiring may make memorial donations to the St. Jude Children's Research Hospital, P. O. Box 1000 Dept. 142, Memphis, TN 38101-9908.